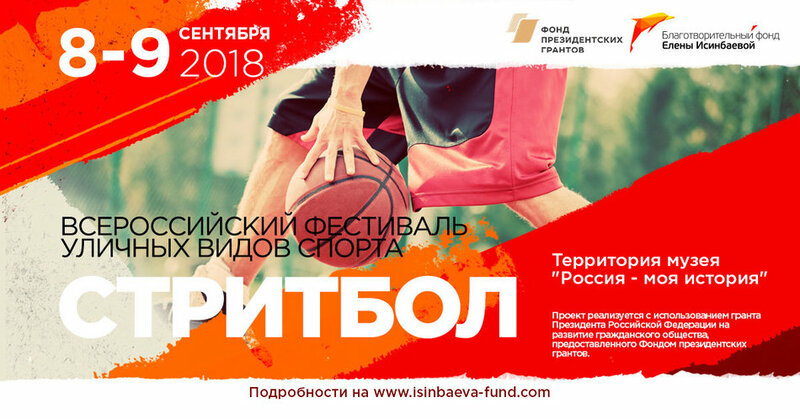 The project « All Russian festival of street sports » is being implemented by Yelena Isinbayeva Charity Foundation with the funds received from the Presidential grant and under support of its special partner Igor Rybakov. 200 athletes from Russia will come to Volgograd on 8 and 9 September to compete in three popular street sporting events: workout, parkour and streetball 3x3. The high status of the festival is confirmed by the variety of regions that the participants come from: Volgograd, Astrakhan, Rostov, Saratov, Samara, Moscow and Leningrad region, Krasnodar, Stavropol and Krasnoyarsk krays and republics of Kalmykia, Mari El, Dagestan and Chechnya. « We are looking forward to welcoming the participants and of course spectators of the festival of street sports. It is hard to show high results when there are no spectators. We and the fund’s team promise you an incredible performance and a lot of positive emotions at the festival! » - said Yelena Isinbayeva, two-time Olympic champion and President of the Charity fund. Shortly before the festival we filmed three short-length films titled «Manifestation of spiritual liberty” which tell you about parkour, workout and streetball 3x3 sports. These films introduce the audience to the characters that share their philosophy of street sports. In order to become a participant of the festival you should send an electronic application, receive a confirmation from the organizers and provide the necessary documents. Every registered participant will receive a starting kit with an official t-shirt, a participant number, a badge, a certificate about participation, a power bank, a shaker, a sticker pack and a bottle of sports water. For this festival mobile sporting equipment for parkour and workout was prepared, as well as we ordered six mobile streetball units. Winners in each event will be awarded with a cup, medals with a unique design, a certificate, a gift from Yelena Isinbayeva Fund and money award from the special partner Igor Rybakov. For the first place the athletes will receive 21 thousand rubles, for the second – 15 thousand rubles, and for the third – 10 thousand rubles. Individual income taxes will be imposed on the money prizes in accordance with the article 224 of the Revenue Code. Numerous interactive zones will be installed for the visitors of the festival. There will be dancing performances by Volgograd dance schools, performance from freestyler MC Fylia, a slam-dunk competition, quiz shows, contests, photo zones and instant photo printing with a hashtag #StreetSportsFest. On the second day the visitors will be able to enjoy the performance of a music cover group “Kakaya raznitsa” (“Whatever”), have fun with an activities organizer Mishka Plombir and see a show of foam clouds. Yelena Isinbayeva, two-time Olympic champion, will give a motivation speech for the participants and visitors of the festival. She will share her keys to the success and answer your questions. The authors of the best questions will receive gifts. We invite all citizens and visitors of Volgograd to come and support the participants of the festival and enjoy the spectacular show on 8 and 9 September from 11 am to 16:00 pm on the territory of the new Russian history museum in Volgograd.